The rise of smart technology has brought with it many new and exciting innovations in a range of fields and integration between different types of technology. Now with our smartphones we can check our emails, take stunning photographs, buy our groceries, and even check in on our pets at home. With our smartphones we can also optimize the way we heat our houses, adjust our heating levels, and save ourselves money. However, in order to get those benefits we need the right smart thermostat. 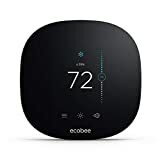 We need something like the Ecobee3, one of the most advanced thermostats on the market today. WHAT IS THE ECOBEE3 SMART THERMOSTAT? The Ecobee3 Smart Thermostat is designed to make sure your house is always the right temperature for you. To do this, it goes above and beyond what you might expect a thermostat to do. 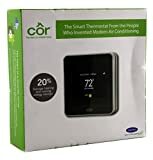 Not only can you control this WiFi compatible thermostat via your computer or smartphone, but the thermostat itself comes with special sensors in order to monitor the different rooms in your house and adjust them according to your needs and preferences. The Ecobee3 smart thermostat system features a wall-mounted thermostat with extra sensors that can be placed around the house to monitor different areas. It is not only able to monitor the temperature inside your house, but is also able to adjust the temperature in your house based on the weather and temperature outside the house at any given time. The Ecobee’s motion sensors can tell when you’re at home or away, and when you leave it will adjust the temperature to make sure you’re not spending all your money on heating an empty house. Though the idea is that a Smart Thermostat will save you money in the long run by heating your house intelligently and cutting down on energy waste, shelling out for one can feel like a lot to spend all in one go. The Ecobee3 is available on Amazon and is priced within the average price range. The Ecobee3 is easy to use though some controls take a bit of getting used to; for example, the temperature control slider. However, once you are used to the controls, you’ll find it a breeze to operate the system through the home wall unit, your smartphone, or your computer, as all these interfaces have the same design. Users found it easy to access the thermostat’s settings via the LCD touchscreen of the wall unit and appreciated how user-friendly it was. The Ecobee3 functions either via a C-wire, or via the included wire box. If you already have a C-wire then the set-up is very straightforward as the system does not require installation by a professional. 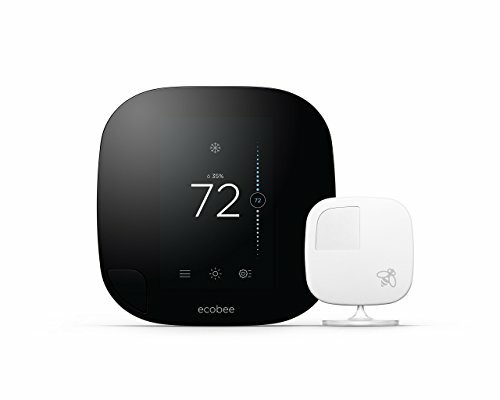 The touchscreen of the Ecobee can guide you through the initial set-up process, and once that is completed owners can choose their preferred heating and cooling settings either at the wall interface, via the smartphone app, or online via the Ecobee website. Users felt that this was a good quality product and appreciated the fact that the Ecobee3 comes with a 3 year warranty. The Ecobee has a lot of excellent innovative features. There are the motion sensors, the extra room sensors, and the WiFi connectivity which ensures that you can always adjust your thermostat no matter where you are. There is also the analytics side of the thermostat: the Ecobee3 is able to generate detailed usage reports so that you can see exactly how and when you are spending your money on energy usage. The Nest is another wall mounted Smart Thermostat featuring a learning algorithm, WiFi connectivity, a smartphone app, and other useful features. The Nest system is really designed for smaller homes where only one or two thermostats are needed. Nest manufacture a whole host of smart technologies for your home, including internal cameras and smoke detectors, and all the devices are able to be integrated seamlessly and will communicate with each other. Your Nest can also be voice controlled through Amazon’s Alexa. The smartphone app is well built and easy to use, but you can also adjust the temperature easily on the wall-mounted display of the thermostat. Some users noted that it took a little while to figure out the best ways to use this product; however, they all seemed to think it was worth the time it took. If you are the sort of person who is capable enough with electrics that they can change a light switch, then you’re unlikely to have any problems installing the Nest by yourself. However, bear in mind that Nest highly recommends that their system is installed by a professional because of the high electrical voltage involved in the system. Some users found that it was not so easy to connect the Nest with their heat pump, and others found that their smart furnaces were not compatible with Nest technology, so if you’ve recently replaced your furnace with something advanced it might be worth checking into this before you buy. The Nest features a stylish circular display which you won’t mind showing off on your wall. The surround can be ordered in black, white, stainless steel, or copper, meaning that you’ll be able to find one to fit in with your interior design tastes. A few users reported that their Nest had malfunctioned, but noted that customer service had quickly replaced the faulty Nest units, and also paid to cover installation costs of the new units. Most importantly, the Nest is a “learning” thermostat. Over time it is supposed to learn how you like things to be in your house and change them before you need to tell it to make that change. Some users thought that the Nest was a rather slow learner, but in general people were pleased with the progress it made whilst in learning mode. Of course, it is also possible to turn off learning mode and program the thermostat manually to adjust itself on a timetable. Honeywell are not such a well-known brand name as the likes of Hive or Nest, but that doesn’t mean that they don’t have something to offer to the smart thermostat market. 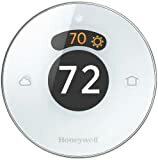 The Honeywell Lyric is just one of their smart thermostats and offers an affordable, smartphone operated thermostat that doesn’t need to be fixed to a wall. The main thermostat of the Honeywell Lyric only needs to be plugged in to a power outlet. The Lyric app provides a step-by-step guide on how to set up the thermostat. It should guide you through the process easily. Some users found that the thermostat struggled to connect with their smartphone or their home WiFi at first, but did connect eventually. However, there is a second box that needs to be attached to your boiler by a professional. Once connected, the unit takes over the heating controls and allows them to be changed by the Lyric thermostat. The design of the Honeywell Lyric is thoughtful and functional. The thermostat is easy to use and functional without being ugly. However, it cannot be operated from multiple zones inside the house, which is a minor drawback. After set-up, users can access the Honeywell Lyric app in order to set their heating schedule; a timetable of when they want their heating to go on and off, and what temperatures they would like it to be at different times of day. Though it takes a little while to put the schedule together, and some of the timings may need a bit of initial adjustment, once it is done the thermostat runs itself. A particularly useful feature of this smart thermostat is “geofencing”, which allows the thermostat to sense when you are coming home. Users can adjust the size of the geofencing boundary in order to give the thermostat enough time to make changes. Users reported that this feature worked most of the time, though it did also prove to be a drain on their smartphone battery. 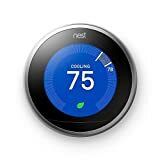 This thermostat can help you to prioritize your heating and save money on utility bills, however, it is also expensive and some of its features and programming feel a bit dated. The Carrier Cor has a large touchscreen display which means it is easy to program. However, the user interface leaves a little to be desired, as it looks a bit dated and is clunky to use. The interface is also not particularly intuitive to use, which makes the process frustrating at times. Although it is more than possible to install this system by yourself, we think you’re going to want a professional to do it. The reason? The Carrier Cor comes with a 5 year warranty if it’s installed by a professional, but that is knocked down to a 3-year warranty if you do it by yourself. Despite the admirable warranties offered on this product, the design quality is somewhat lacking. Many users reported malfunctions and breakdowns in their systems within just a year or two of purchasing. Though these should be covered by the warranties, they are still a cause for concern. The Carrier Cor can adjust not only the temperature in your house, but also the level of humidity. It operates using advanced algorithms that analyze indoor and outdoor temperatures and adjusts the level of heating or cooling accordingly so as not to waste money by overheating the house. This product also produces usage reports so that you can see where and when you are spending the most on your utilities. In this field of contenders, it is fairly safe to say that the Ecobee3 comes out on top. It is in the middle of the field in terms of price but offers an excellent, reliable product. The thermostat can follow your schedule, or be adjusted manually. Its multiple sensors and straightforward app also set it apart from the crowd. The Ecobee3 is able to generate usage reports to give you a clear idea of when you use the most energy, and can also adjust your heating to make sure you aren’t wasting energy. Most users save 25% of their heating bill after switching, so you have almost nothing to lose if you decide to switch.